I’m all for eating lighter in the summer but quite frankly I’ve never been a salad-for-dinner kind of girl. So recently I’ve been making this quinoa dish, which basically involves adding whatever vegetables I have lurking in the fridge to a bowl of quinoa seasoned with thyme, salt and black pepper. It’s perfect when you’re short on time and cooking for one. You can be as creative as you like with the ingredients – think asparagus, toasted pine nuts, broccoli, kale, mushrooms – the choices are endless! Rinse the quinoa then add it to a saucepan with the boiling water and set on a medium-high heat. Stir in the vegetable stock and leave for 20 minutes, stirring occasionally. When you’ve chopped all the veg, melt the coconut oil into a frying pan on a medium heat, then add the onion, yellow pepper and courgettes and leave to soften. 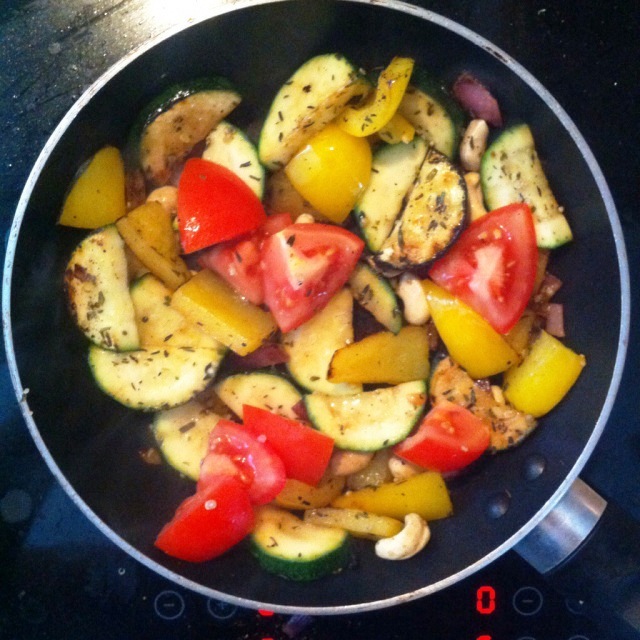 Add a little bit of thyme, sea salt and black pepper to the veg and wait until the courgettes have browned off. Set on a low heat. Just before the quinoa is done, throw in the tomatoes and cashew nuts to the pan, stirring it all together on a low heat. Drain the quinoa of any excess water then add it to the pan with the feta, mixing it all together. Squeeze some fresh lemon over the quinoa, sprinkle on more seasoning if you want and then serve. Bam! Thank you Manny! Congrats on your blog it looks great.